The best views of Budapest are atop Castle Hill. With the steep incline to the top, take a load off and ride the historical Funicular for a view of a lifetime. The Szechenyi Chain Bridge was the first bridge to connect the Buda and the Pest side together, giving easier access across the Danube River in 1872. The Buda Castle sat atop the hill at a 40 degree incline and rose over 300 feet. The strenuous walk up to the castle called for an easier solution and that's when the Funicular was born. It was then called Budavári Sikló. For over 70 years the Funicular made various trips carrying people up and down the hill. During World War II, all of the bridges of Budapest and all of the Castle Hill District was bombed, including the Funicular. Thankfully, pieces of the Funicular had been salvaged after the bombing. It took a long time, but in 1986, the track was restored and reopened to the public. Just a year later the Funicular was added as a historical site and added to the UNESCO World Heritage Sites. It's open everyday from 07:30 am to 10 pm, and the cars run every 5 to 10 minutes. The fare is HUF 1,200 (about US$4) one way for adults (HUF 1,800 round-trip, about US$6), with reduced fare for kids and students aged 3 to 18. Children under 3 get in for free. You can also pair this ride with an iconic boat tour. Click below for more information. Explore Budapest on foot, by cable car and boat on this three-hour guided tour. Wander the grounds of Castle Hill, a UNESCO World Heritage site, and learn about Budapest’s layered history from an expert guide who takes you to Castle Hill’s major sites, including the Royal Palace, Castle Theatre, National Gallery and Sándor Palace. Ride the funicular railway cable car and cross the Chain Bridge, the oldest suspension bridge in continental Europe. Climb aboard a boat and cruise along the beautiful Danube River until you reach the city center pier. What is your favorite thing to do on Castle Hill? 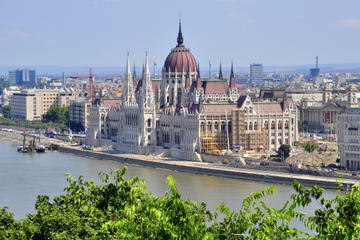 Don't forget to checkout the top 10 things to do in budapest.